I am not able to install Tensorflow in the same way I installed these other packages. How should I install it? Google has recently launched a newer version of Tesnsorflow r0.12 which include support of Windows both CPU and GPU version can now be installed using Python >=3.5.2 (only 64-bit) version. Follow this Tensorflow on Windows for step by step instructions. Use pip install tensorflow in place of pip install tensorflow-gpu, in case if you want to install CPU only version of TF. Note: This installation has been tested with Anaconda Python 3.5 (64 bit). I have also tried the same installation steps with (a) Anaconda Python 3.6 (32 bit), (b) Anaconda Python 3.6 (64 bit), and (c) Anaconda Python 3.5 (32 bit), but all of them (i.e. (a), (b) and (c) ) failed. Currently tensorflow has binaries only for Unix based OS i.e. Ubuntu Mac OS X - that's why no mention of Windows in setup docs. Closed - How to install/run/use TensorFlow on windows machines? A SO answer - tensorflow — is it or will it (sometime soon) be compatible with a windows workflow? It should become easier to add Windows support when Bazel (the build system we are using) adds support for building on Windows, which is on the roadmap for Bazel 0.3. You can see the full Bazel roadmap here. Or simply use a Linux VM (using VMPlayer), and the stated steps will setup it up for you. Now to use the conda interpreter from PyCharm go to file > settings > project > interpreter, select Add local in the project interpreter field (the little gear wheel) and browse the interpreter or past the path. The default location - the environment lives under conda_root/envs/tensorflow. The new python interpreter 'll be at conda_root/envs/tensorflow/bin/pythonX.X , such that the site-packages will be in conda_root/envs/tensorflow/lib/pythonX.X/site-packages. Google has announced support for tensorflow on Windows. Please follow instructions at https://developers.googleblog.com/2016/11/tensorflow-0-12-adds-support-for-windows.html. Please note CUDA8.0 is needed for GPU installation. 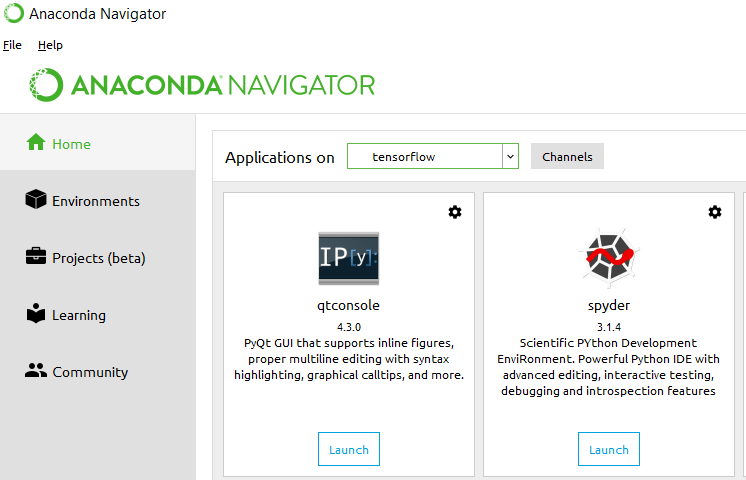 conda install -c conda-forge tensorflow worked for me. None of the other steps mentioned online helped, I found it here when trying to install an older version. Change the dropdown of "Applications on" from "root" to "tensorflow"
Check for python version for which you want to install tensorflow, if you have multiple versions of python. It works, just give it a try. The following command from inside your command window (and preferably, conda environment) will work provided you have an Nvidia graphics card. This way you will have different environments for different TFs. This is what I did for Installing Anaconda Python 3.6 version and Tensorflow on Window 10 64bit.And It was success! Go to https://www.continuum.io/downloads to download Anaconda Python 3.6 version for Window 64bit. If the output you got is 'Hello, TensorFlow! ',that means you have successfully install your Tensorflow. Additionally if you want to run a Jupyter Notebook and use TensorFlow in it. Use following steps. If you have anaconda version 2.7 installed on your windows, then go to anaconda prompt, type these two commands: 1. Create a conda environment for tensorflow using "conda create -n tensorflow_env tensorflow" 2. activate the tensorflow using "conda activate tensorflow_env"
If it is activated then the base will be replaced by tensorflow_env i.e. now it will show "(tensorflow_env) C:\Users> "
You can now use import tensorflow as tf for using tensorflow in your code. "Conda" installs some of the special packages that might have compiled in C or other languages. You can use "pip install tensorflow" and it will work. Not the answer you're looking for? Browse other questions tagged python windows anaconda tensorflow conda or ask your own question. Is Tensorflow compatible with a Windows workflow? How to use tensorflow on spyder? How to install Tensorflow on Windows 10 with anaconda? Does Conda replace the need for virtualenv?